Sorbothane, Inc. strives to provide you with the latest in shock absorption and vibration-reducing solutions, as well as taking innovative looks at the problems around us. Our quarterly eNewsletter allows us to do all that and more, and deliver it right to your inbox. 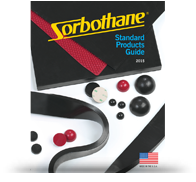 Whether you're an engineer with a complicated task at hand, or an entrepreneur with the next big idea, you'll find fresh content and unique ideas in each edition of Sorbothane Solutions. Sign up below.